Streetsblog LA wonders if the W Hollywood is real Transit Oriented Development or if it's just pretending. 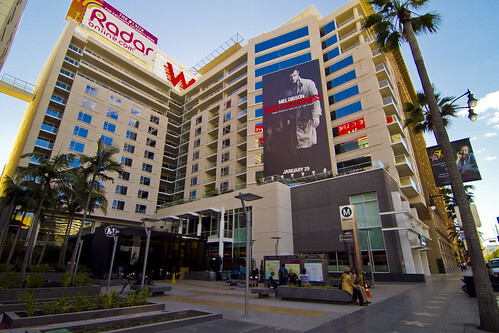 Damien Newton over at Streetsblog LA takes a look at Metro’s latest joint development project, the W Hotel at Hollywood and Vine and questions whether it’s Transit Oriented Development (TOD) or the lesser Transit Adjacent Development (TAD). He comes to the conclusion that it is indeed a TAD. The lack of affordable housing, the emphasis on parking and the absence of useful bicycle facilities are all cited as reasons for the W’s TAD status. KPBS has an 36 minute radio show dedicated to high speed rail in California – where we’re at now and what the future holds. Guests include Jeffrey Barker from the California High-Speed Rail Authority, Pat Merrill of Amtrak and Yonah Freemark of The Transport Politic blog. The guests answer listener calls and questions. As Amtrak prepares to take over Metrolink operations this summer a potential labor dispute is brewing. Amtrak requires personality screening tests for all job applicants and current Metrolink crew members will have to take these tests if they wish to continue working. Labor unions are up in arms about this and are holding their ground, refusing to take the tests.